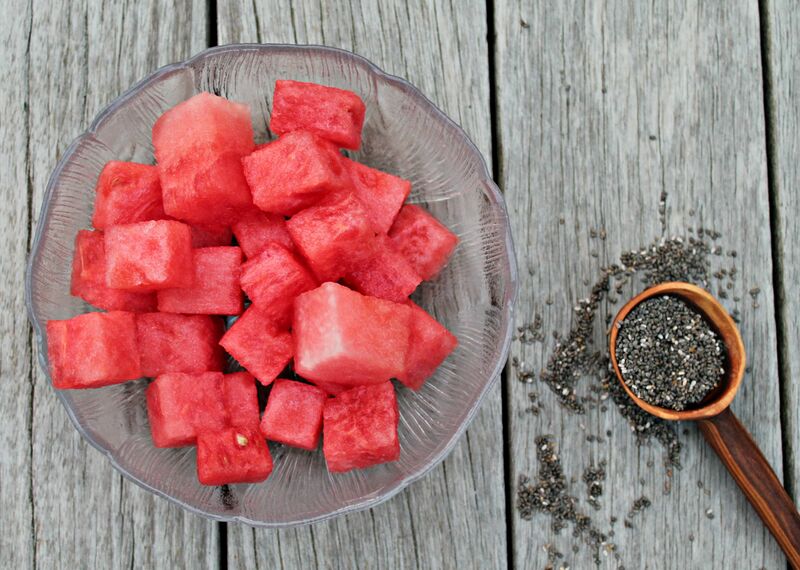 Watermelon chia pops are the perfect summer treat with a healthy addition! These popsicles will become your favorite this summer season, because nothing makes your body feel cooler than biting into a slice of fresh watermelon. Even better when they’re watermelon chia pops! Lately, we’ve been buying so much watermelon that I don’t know what to do with it. Actually, we just tend to buy HUGE ones that end up becoming juices, waters, and now these watermelon chia pops! These are super easy to make, taking about 5 minutes or less – as long as it takes you to blend the watermelon together. Watermelons are mostly water — about 92 percent, but this refreshing and sweet fruit is soaked with nutrients, too. Each juicy, fresh bite has significant levels of vitamins A, B6 and C, lots of lycopene, antioxidants and amino acids. It is the perfect summer fruit, in my opinion. And it only gets better, because the chia seeds are packed with omega-3’s, which we all need more of. Try this summer treat today, and I promise you won’t be disappointed! Be sure to add lime, because it adds the perfect balance to the sweet watermelon. Here’s the watermelon chia pops recipe. Enjoy! The perfect cool treat during these hot summer days! Place all the ingredients but the chia seeds in the blend. Blend until smooth. Pour mixture into container with spout and whisk in the chia seeds. Another delicious watermelon recipe you should take a peek at is this refreshing White Tea Watermelon Cocktail. It is summer refreshment with a bit of antioxidant healthiness built in! Have a sweet watermelon day!